The Royale circular needles are a gorgeous wool and metal combination. They have added shiny metal tips that taper to a nice sharp point. The unique combination of wood and metal not only gives a refined look to the needles, but also provides an incomparable knitting experience! Each size is a different color, making it super easy to keep track of what needle you are using! 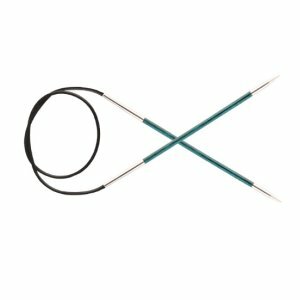 Knitter's Pride Zing Fixed Circular Needles and Jimmy Beans Wool Jimmy's SmartStix 32 Inch Circular Needles are both similar needles: 32" (80cm), circular, and US 4 (3.5mm) US size.